Furthermore, Amazon (AMZN) may be disrupting the credit card transaction space with its potential launch of Amazon financial services and Amazon Pay. Despite Visa’s massive move over the past year, growth has become worrisome and touched down to single digits before bouncing back to double digits over the last two quarters. 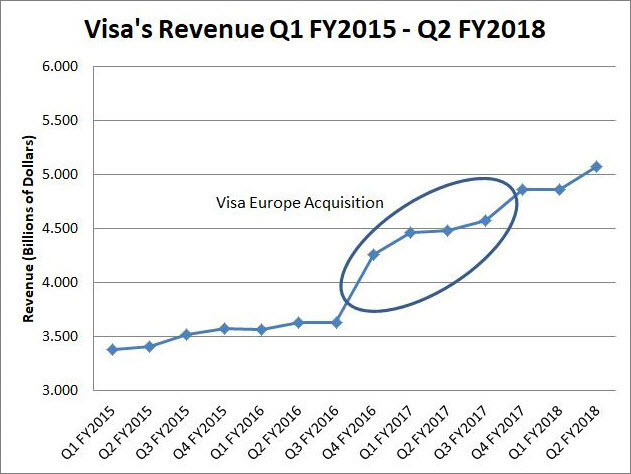 I feel that shareholders have become overly enthusiastic about Visa’s growth prospects. The stock has appreciated over 45% during the past year, boasts a P/E of over 35 and a PEG of over 2.0 in the midst of a frothy market. This scenario doesn’t provide a great benefit-reward profile at these levels in my opinion. PayPal has been a growing threat over the years, and Jim Cramer interviewed PayPal’s CEO Dan Schulman on Mad Money regarding the prospects and future of the payments space as he sees it, domestically and internationally. "When you go through digital its's a more efficient system, there aren't middlemen in-between to take part of the transaction and there's less corruption." "Nothing against Mastercard (MA) and Visa, they're still great growth stocks, but the growth of the future is yours [Pay Pal]." This interview sheds light on the potential pivot away from credit card infrastructure to digital payments and money management in the digital age, particularly in India and China. PayPal has witnessed explosive growth in the digital payments space and peer-to-peer money management and transfer via its Venmo platform. Another huge potential disruption in the credit card transaction space lies in blockchain technology that underpins the cryptocurrency markets. This technology applies to enterprise applications using its decentralized database, open ledger, and incorruptible transactional capabilities. Financial intuitions are already engaging in pilot programs to migrate away from traditional networks like Visa’s. American Express, for example, is exploring this technology with Ripple’s blockchain technology. Visa has a partnership with BTL Group (BTLLF) and IBM (IBM) exploring this superior technology for potential use. IBM is aggressively stepping into the enterprise blockchain solutions space as well. Google is now entering into the blockchain space as well via investing in start-ups working on blockchain technology per CBInsights. Google has made six investments in the space which include decentralized cloud storage provider Storj, cryptocurrency derivatives trading platform LedgerX and Veem, a company working on faster and less expensive digital payment services for small- and medium-sized businesses. Google is also invested in digital gift card platform Gyft and Ripple, a company that settles international transactions for banks. Furthermore, Google is developing a blockchain service to support its cloud business, per Bloomberg. Google plans to offer the service on its Google Cloud Platform, as well as a stand-alone version which companies can run on their own servers. Ant Financial, a subsidiary of e-commerce giant Alibaba, is using some of the $14 billion treasure chests it just raised to invest in blockchain. "The Company will continue to invest in developing its blockchain, AI, security, IoT, and computing capabilities to upgrade its global technology platform for the next generation," Ant Financial said in a statement. Nonetheless, Visa is exploring possibilities with blockchain via its B2B sector. Late in 2017, Visa announced that it was working with its banking partners to test bank-to-bank test transactions. This included Commerce Bank in the US, Shinhan Bank in South Korea, Union Bank of Philippines and United Overseas Bank in Singapore. Visa will continue to explore other capabilities with blockchain technology, Kelly said. Ostensibly, Visa recognizes that blockchain is a potential threat and exploring avenues to leverage this technology. The risk to the $90 billion-a-year swipe-fee industry is larger if Amazon’s product resonates with younger demographics or Amazon Prime members. Prime members spent about $117 billion with the retailer in 2017, up 50 percent from the previous year, according to Consumer Intelligence Research Partners in Chicago. If 15 percent of Amazon shoppers switch to its new account, the company could save $250 million a year in so-called credit card interchange fees, according to estimates by Bain. 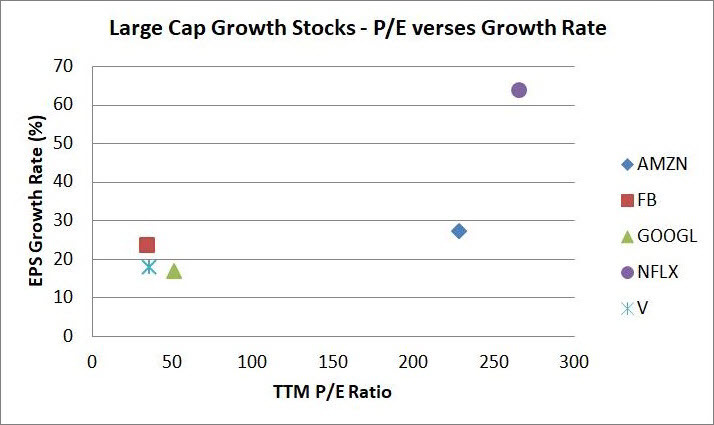 Visa’s stock price is misaligned with its overall revenue growth prospects with an unjustified P/E and PEG ratio that remains higher than the majority of large-cap growth stocks that have a greater growth profile such as Facebook (FB) for example. Visa’s management has forecasted continued revenue growth in the high single digits with EPS growth in the mid-teens, artificially high due to share buybacks. This forward-looking revenue growth rate is a shape divergence from the past year-plus revenue growth numbers. As I posited previously, Visa’s growth rate is slowing, now confirmed by Visa’s management and thus misaligned with the stock’s 40% plus appreciation over the past year, P/E ratio, PEG ratio and overall revenue growth prospects. Investors have been accustomed to year-over-year quarterly revenue growth in the double digits over the past year, specifically post Visa Europe acquisition and integration. FYQ1 2018 numbers reported at 9%. Clearly, this is a different growth narrative. Now, with FY2018 off to single-digit year-over-year revenue growth which management affirmed will be the case for the remainder of FY2018 (Figure 1). I’m taking the revenue position in this analysis as this is the true measure of business activity and growth. EPS, P/E and PEG can all be misleading in different ways and easily be financially engineered via share buybacks which Visa is engaging in and buying back shares at all-time highs. While EPS growth is ostensibly great, without revenue growth, it’s meaningless. This stock has appreciated 45% over the past year, is richly valued and possesses a high premium relative to other large-cap growth stocks. These trends indicate that year-over-year growth rates are primarily attributable to Visa Europe. 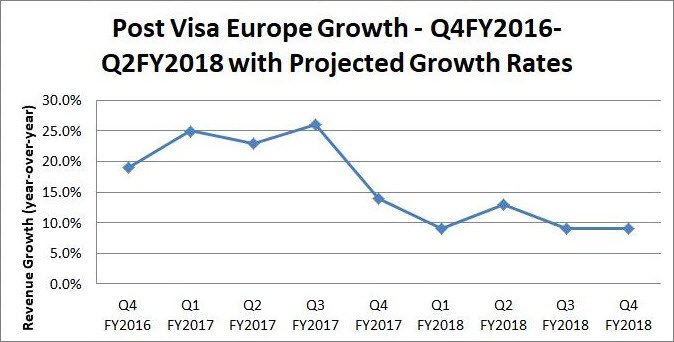 After a full year of Visa Europe earnings on the books, these growth rates are now in the single digits and slowed down dramatically as we are witnessing the latest 9% growth in Q1 2018. Any miss or significant slowdown in future quarterly earnings could derail this stock as it's priced for perfection.